The exciting holiday season is almost here. If you love to entertain, then the upcoming months are sure to be filled with family get-togethers, festive parties and big celebrations, all with a food and beverage focus. Having the right table serveware will provide you with an effortless way to entertain while giving guests the most enjoyable holiday experience. With that in mind, we’ve brought you a new range of Mesa Home serveware just in time to accommodate all of your festive times this holiday season. From decorative and functional flatware caddies for keeping those utensils neat and handy to space-saving tiered baskets for displaying and serving fruits and other edibles, you’re sure to find the perfect serveware for any purpose and occasion. Below are a few products from Mesa Home’s new range. 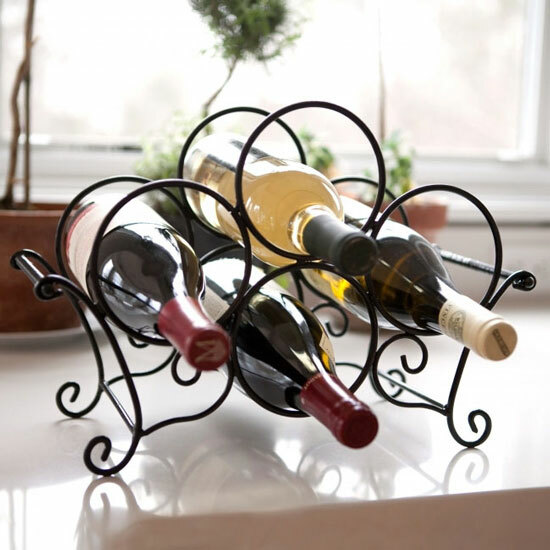 The elegant Scroll 4 Bottle Wine Rack provides a lovely decorative way to display wine before serving. It features all of the classic scrolls and ornate details of classic wrought iron design with a black metal finish. Place in the dining room on a buffet or the kitchen island for more casual get-togethers. The Pasha 2-Tier Round Basket boasts a small and medium round basket highlighted with a decorative lattice two-tier design, arched handle and tiny out-turned ball feet. It’s perfect for holding fruit, vegetables, pastries and bread while adding an elegant touch to any table, buffet or kitchen counter. Whether you’re hosting a Sunday brunch or evening buffet, you’ll want to make serving a cinch with easy access to all dining utensils, including flatware. The Pasha Flatware Caddy offers an effortless way to keep flatware corralled and close at hand. It features a lovely lattice design with looped handle and footed base. If you’re a die-hard coffee or tea drinker, then you’ll appreciate having mugs close at hand when the brewing urge strikes or you’re hosting a brunch or luncheon. Mesa Home brings the classic black metal mug tree design back to life with the Vintage 8 Mug Tree. It features a compact, two-tier design that fits perfectly on the kitchen counter, by the brewing station or on a buffet for entertaining. Visit Timeless Wrought Iron to shop the full Mesa Home line of affordable, purposeful and decorative products and serveware for kitchen, dining and entertaining.